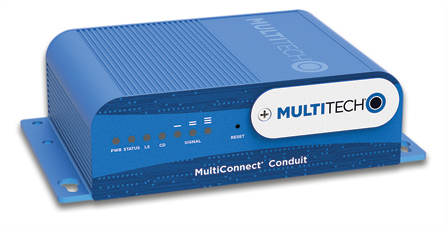 MultiConnect® Conduit™ is a programmable gateway with an open development environment to enable machine-to-machine (M2M) connectivity using various wireless communications including GPRS, 3G, 4G and LoRa. This guide is designed to help you setup the MultiTech MultiConnect Conduit gateway and how to convert it into a single Packet Forwarder to the The Things Network. USB Male type A to Male micro B. 1. Disconnect power to the gateway. 2. At the back of the gateway's housing, determine between either the AP1 or AP2 port to install the accessory card. Remove the port cover to insert the mCard. 3. Slide the card into the opening gently until you feel the card connectors are fully connected to the internal connector. 4. Use a small screwdriver to attach the card bracket to the housing with the screw from the port cover. 5. Attach the LoRa antenna to the LoRa mCard. 1. At the front of the Conduit housing, remove the screw that secures the nameplate to the Conduit and remove the nameplate. 2. Locate the SIM card holder in the upper right corner of the opening. If a blank SIM card is installed, it needs to be removed. Slide the incorrect SIM out of the SIM card holder to replace it. 3. Gently push the new, activated SIM card into SIM card holder face up with the cut corner to the right establishing SIM connection with the Conduit gateway. 4. If you are not installing a battery or micro SD card at this time, reattach the MultiTech nameplate to the Conduit using the screw removed in previous step. To install a Micro SD card or a battery, please refer to MultiTech’s website. After configured properly the Packet Forwarder in the respective Multitech Conduit Gateway used, you should be able to see the data received from the LoRa nodes hosted in your The Things Network account. Now your Multitech Conduit Gateway is ready to work over LoRaWAN using the TTN service to push data to Ubidots Cloud to transform your raw data into insights.